There are no larger images of the thumbnails. 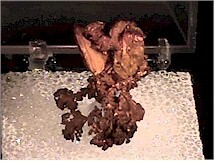 Calcite pseudo after Ikaite: Kola Peninsula, Russia. This is complete all the way around, no point of attachment. 3 cm (1-1/4") across. Copper: Ray Mine, Pinal County, Arizona. Rutile: Diamantina, Minas Gerais, Brazil. 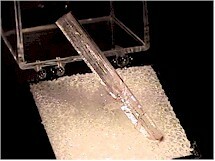 Double terminated rutile crystals in parallel growth. A super thumbnail! 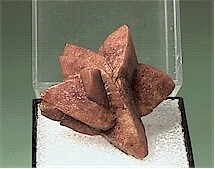 1" (2-1/2cm) across. A light pink fluorapatite crystal, w/ minor lepidolite attached. A little too large to be called a true thumbnail. 3-1/2cm (1-3/8") tall. 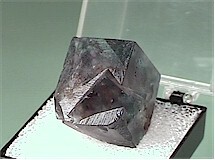 Fluorite: Heights Quarry, Durham, England. Intergrown cubes of green fluorite. These show different colors under various light sources. 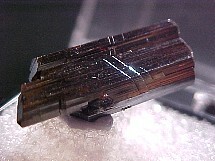 2 - cm. tall. 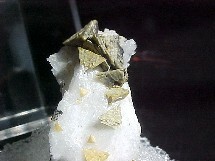 Helvite on Albite: Minas Gerais, Brazil. "Olive" green helvite crystals on snow white albite. This wonderful specimen comes from the Navagador Mine, Conselheiro Pena. 1" (2-1/2cm) tall.